It’s free to play; it shouldn’t be this good, right? I mean I almost checked the disc tray to see if there was a retail copy of Battlefield Play4Free (announced earlier today) in the rig while I got some hands on time with it earlier in the week. That’s not to say Battlefield Heroes was sub-par in anyway, but it was a big step away from what we expect from a game in the Battlefield series. What EA is giving us this time is much closer to the franchise; first-person combat, modern warfare and tonnes of realistic weapons and vehicles; it’ll fit like a glove to anyone that’s played one of DICE’s more recent efforts. BF Play4Free is a mish mash of elements from both Battlefield 2 and Bad Company 2, taking the formers maps and the latter’s weapons to create a sort of best of mix. I jumped in for a few rounds on one of the game’s urban maps. Straight away it’ll hit you just how polished this title is, especially for a free-to-play game. Using Bad Company 2‘s film grain really creates a cinematic effect and the same weapon models are used too, meaning that this is no slouch visually. Environments are kind of generic now, given that they’re recycled/re-imagined from a much older game, but they still look nice, and offer a fun playground of destruction. I got to run around the map for a while armed with a rifle. The conditions I played the game in meant I spent a lot of time looking for enemies to gun down, but when I did use my weapons they felt precise and very, very deadly. Gunplay is pretty much what you’d expect in fact, making it easy to slip right into the game. You’ll line up your sights, and a short burst of fire will bring unsuspecting foes down. It’s incredibly accessible, which is what it needs to be. If EA finds an easy way of saying “Hey, why spend $60 on Call of Duty when you could play this for free?” they could well hook people in with just the first few seconds of play time. The thing is that all the game needs to do is offer a solid shooting experience (like it does) and the price will take care of the rest. And once you’re in, you’ll find the vehicles, the glorious vehicles. I tore through the city in a tank for a good while and laid on a little destruction. Again, it works much like any other Battlefield before it, giving you the upper hand on simple infantry and helping you gain a lot of ground. However, your opponents have some other devices to use against you. For example, a tracer dart can be shot by one class which will then give other classes with RPGs something to lock on to. That made short work of my vehicle, leaving me in a mound of firey rubble and very much dead. Again… that’s pretty similar to my past experiences with Battlefield but that’s more of a personal thing. 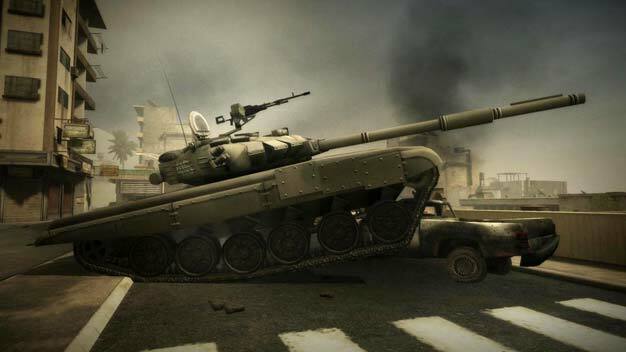 I’d need a bit more time with Play4Free to give a definitive verdict; it’s a lot like other Battlefield titles before it and it’ll take a little while longer to work out the differences, including how the character customistation works and what other weapons/vehicles are available. The game’s promising a lot more than what I saw with my time, and once it all comes together it’s set to be a very impressive package. The main thing to take away right now that this is a fully fleshed out, completely functioning Battlefield game that is incredibly easy on the wallet. And that’s awesome, really awesome.